The lead scavenger 1,2-dibromoethane (EDB), a former additive to leaded gasoline, is a common groundwater contaminant, yet not much knowledge is available for its targeted bioremediation, especially under in situ conditions. The study site was an aviation gas spill site, which, although all hydrocarbons and most of the EDB were remediated in the mid-1990s, still exhibits low levels of EDB remaining in the groundwater (about 11 μg EDB/l). To evaluate the effect of phenol on biostimulation of low concentration of EDB, microcosms were established from an EDB-contaminated aquifer. After 300 days at environmentally relevant conditions (12 ± 2 °C, static incubation), EDB was not significantly removed from unamended microcosms compared to the abiotic control. However, in treatments amended with phenol, up to 80 % of the initial EDB concentration had been degraded, while added phenol was removed completely. Microbial community composition in unamended and phenol-amended microcosms remained unchanged, and Polaromonas sp. 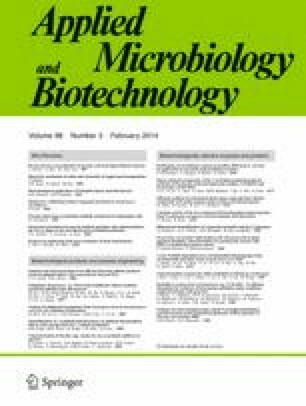 dominated both types of microcosms, but total bacterial abundance and numbers of the gene for phenol hydroxylase were higher in phenol-amended microcosms. Dehalogenase, an indicator suggesting targeted aerobic biodegradation of EDB, was not detected in either treatment. This finding suggests phenol hydroxylase, rather than a dehalogenation reaction, may be responsible for 1,2-dibromoethane oxidation under in situ conditions. In addition, biostimulation of EDB is possible through the addition of low levels of phenol in aerobic groundwater sites. The online version of this article (doi: 10.1007/s00253-013-4963-1) contains supplementary material, which is available to authorized users. This research was funded by the Air Force Center for Engineering and the Environment (AFCEE). We thank AFCEE/CH2M HILL for providing us with soil core and groundwater samples. MDEP, Massachusetts Department of Environmental Protection (2004) Current Regulatory Limit: Ethylene Dibromide (EDB), http://www.mass.gov/dep/water/drinking/standards/edibrom.htm. Wilson JT, Banks K, Earle RC, He Y, Kuder T, Adair C ( 2008) Natural attenuation of the lead scavengers 1,2-dibromoethane (EDB) and 1,2-dichloroethane (1,2-DCA) at motor fuel release sites and implications for risk management. USEPA National Risk Management Research Laboratory. EPA 600/R-08/107 http://www.epa.gov/ahaazvuc/pubs/reports.html.